Facilitators rely on hundreds of tools to gather information, support decision-making, encourage innovation, build camaraderie, strive for higher quality, or guide a facilitator through an unplanned pathway. Therefore, your selection of the “best” structured facilitation tools depends on many factors. There is more than one appropriate option. 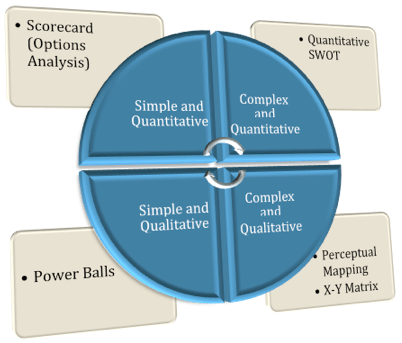 For example, we can capture initial input or meaning from participants through the Brainstorming (ie, narrative), Creativity (ie, drawing), PowerBalls (ie, iconic), or SWOT (ie, numeric). Only use a tool if it is correcting a problem or situation. The tool must add value or it distracts from the method. For example, do not lead a team-building exercise if the team is highly functional. Do not ask the group permission to use a tool. You are the leader and need to set the method—so do it. Never present the tool as a game or a gimmick. This often leads to resistance. Discipline your rhetoric when explaining the Purpose tool. For example, do not ask about ‘today’s purpose’ since you are expected to know the purpose of the meeting. Except for team-building tools, explain the deliverable from each tool used and how it supports completing the deliverable. Do not be afraid to use a new tool—they have all been field-tested and work well when used properly. Build tool contingencies into your agenda—ie, plan to use a specific tool. However, if a problem arises, do not be afraid to substitute for something more appropriate. For tools designed to correct situations such as team dysfunction and lack of creativity, remember that most groups did not become dysfunctional in ten minutes and the situation will not be corrected through a ten-minute exercise. It often takes numerous exercises and a great deal of time to see a real difference. Do not give up and you will earn their respect for perseverance. Review the tool selection chart below to help determine which tool helps achieve your desired outcome. Prepare your materials in advance, along with prompts and assignments (eg, CEO and team names), and rehearse new or complicated tools. Provide clear and explicit instructions, preferably posted or written down as handouts. Emphasize any rules. Monitor group activity closely, especially in the beginning and make yourself readily available for clarifying areas of fear, doubt, or uncertainty. Compare the purpose with the output. Reinforce the learning and how it applies to accelerating the group’s performance toward your meeting or workshop deliverables. Use the following matrix to help guide you to the most appropriate decision-making tools based on the type of information (ie, qualitative or quantitative) and complexity of the decision (ie, concrete or abstract). Continue to add to your tool chest. When co-located in an enterprise with other facilitators, build a Community of Practice (ie, CoP) that archives tools, visual prompts, and retrospective reviews. Strive to speed up selection and avoid repetition for your participants. For additional exercises and tools for facilitators look at Games Trainers Play and More Games Trainers Play by John Newstrom and Edward Scannell, New York, McGraw-Hill Book Company, various. You can also order the IAF (International Association of Facilitators) Handbook of Group Facilitation and other resources at Amazon.com among others. There are thousands of tools and resources for facilitators and team-building tools in English and other languages. Meanwhile, MG RUSH professional facilitation curriculum focuses on practicing methodology. Each student thoroughly practices and rehearses tools before class concludes. While some call this immersion, we call it the road to building impactful facilitation skills. Take a class or forward this to someone who should. MG RUSH Professional Facilitation curriculum provides an excellent way to earn up to 40 SEUs from the Scrum Alliance, 40 PDUs from PMI, 40 CDUs from IIBA, and 3.2 CEUs. As a member of the International Association of Facilitators (IAF), our Professional Facilitation, our training fully aligns with IAF Certification Principles. Consequently, our professional curriculum fully prepares alumni for their Certified Professional Facilitator designation. Furthermore, all of our classes immerse students in the responsibilities and dynamics of effective facilitation and methodology. Because nobody is smarter than everybody, attend an MG RUSH Professional Facilitation, Leadership, and Methodology workshop offered around the world. See MG RUSH for a current schedule. Additionally, go to the Facilitation Training Store to access proven in-house resources. There you will discover fully annotated agendas, break timers, and templates. Finally, take a few seconds to buy us a cup of coffee and please SHARE with others.